A quick and easy snack to enjoy in the comfort of home or paired with a cup of coffee as a light brunch or served as an appetizer. You’ve probably seen more and more toast on café menus or even entire menus dedicated to artisan toast with various toppings. As the The New Yorker puts it, ‘The Trend is Toast’. We love toast at the farm too and are delighted to share our go-to lavender toast combinations using a few of our farm-made lavender culinary ingredients. 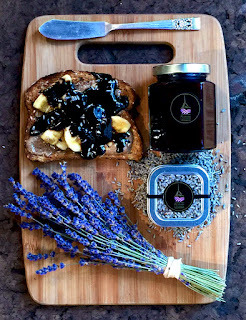 While toast is very simple to make, lavender adds an herbal, aromatic complexity to the flavor and the sweet drizzle of our lavender condiments, a visual elegance. Start with your favorite bread - maybe a seeded multi-grain or a thick slice of a crusty baguette from your local bakery or even a gluten-free option. To assemble the toasts, let the bread cool and then spread a generous amount of Organic Lavender Honey and your choice of nut butter onto the toast. 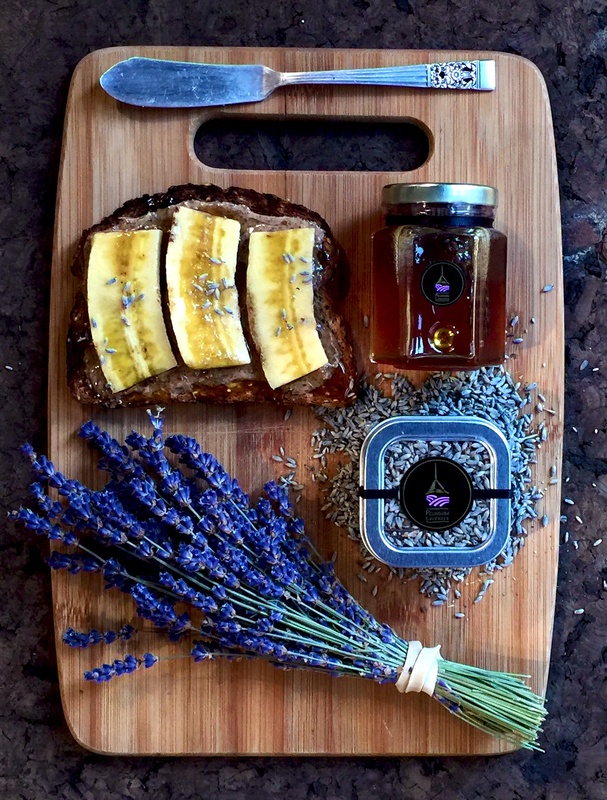 Lay the sliced bananas on top, drizzle with a little more Organic Lavender Honey and finish with a sprinkling of Organic Culinary Lavender. 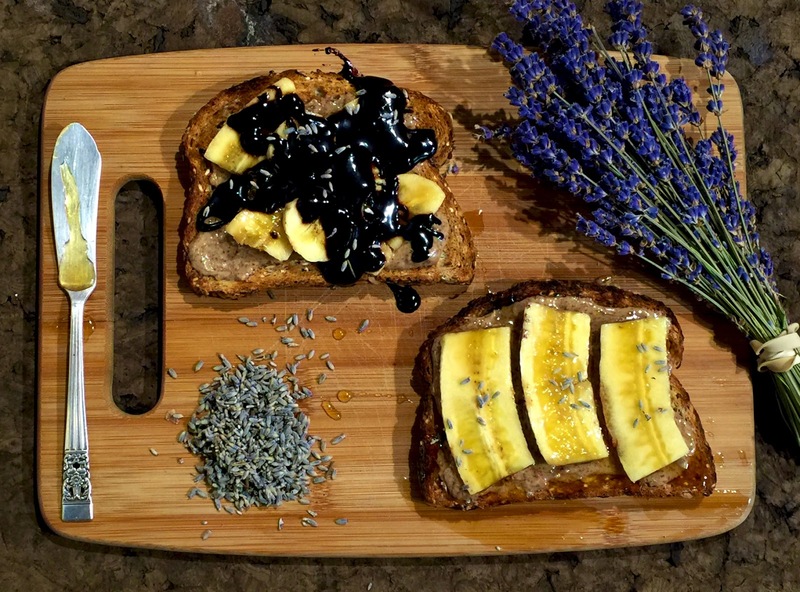 As a variant, spread Lavender Bittersweet Chocolate Sauce on top of the sliced banana before finishing with a sprinkling of Organic Culinary Lavender. When cooking with lavender it's important to use culinary lavender that has relatively low levels of essential oil. Lavender Essential Oil, although it’s fragrance is wonderful, can be paradoxically bitter to the taste when used in excess. When used in small amounts, it lends a delightfully delicate yet distinctive flavor to a wide variety of food and beverages. Too much and the bitterness can drown everything else out. The lavender we use in all our culinary products and recipes comes from "our culinary harvest" which is harvested early in the summer when the first blossoms begin to appear and the build-up of essential oil in the buds is still in its early stages. Lavender harvested later in the season will contain more essential oil than is desirable for cooking, and lead to a less enjoyable culinary experience. Used properly, however, it can work extraordinarily well — interestingly on both the savory and sweet sides of the palate. So, if you have a lavender plant at home be sure to harvest for cooking early in the season when just a couple of the buds have bloomed. If you want to make sachets or other fragrant crafts, wait to harvest until the end of the summer when all the buds have flowered. What are your favorite toast dressings?